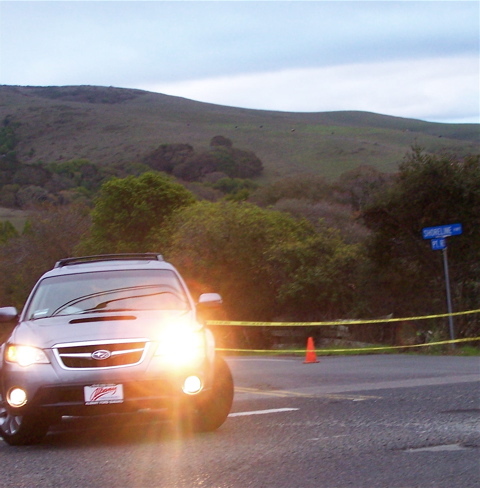 A motorist turns around just before sunset Saturday upon discovering the Point Reyes-Petaluma Road barricaded at Highway 1. The road was closed all day after a car crash brought down powerlines. Two power outages in and around Point Reyes Station blacked out the town for approximately an hour and a half Friday evening and caused chaos on the Point Reyes-Petaluma Road Saturday. The first blackout began around 6:30 p.m. when PG&E shut off power to the town in order to repair a broken arm on a Third Street utility pole. The arm had been broken earlier in the day. 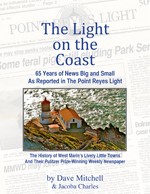 Before shutting the power off Friday, PG&E warned Point Reyes Station merchants, and nightspots such as the Old Western Saloon and the Station House Café remained open using candles and lanterns. Neighboring towns were not affected. The second outage which blacked out only a few homes beside Nicasio Reservoir, resulted from a car crash around 1 a.m. Saturday. “Somebody knocked out a pole right at Graffiti Bridge,” Chuck Gompertz, who lives on nearby Laurel Canyon Road, told me. Gompertz said he learned from a neighbor that after the crash, the driver “jumped out of the car and ran away.” Point Reyes Station firefighters confirmed the driver had fled the scene. When the car, a white Ford Bronco, broke the utility pole, powerlines fell across Platform Bridge (AKA Graffiti Bridge), forcing closure of both Platform Bridge Road and the Point Reyes-Petaluma Road. Both remained closed Saturday morning and afternoon, with the Point Reyes-Petaluma Road barricaded at Highway 1 in Point Reyes Station and at Four Corners (the intersection with Nicasio Valley Road). As it happened, a resident along the Point Reyes-Petaluma Road between Four Corners and Platform Bridge was having a party Saturday morning and asked another Nicasio resident, Pete Casartelli, to go down to the barricade and let guests through. What Pete found, Gompertz said, was an endless stream of tourists frustrated and confused at finding their route to the coast blocked. Pete then took over directing traffic, added Gompertz, who temporarily joined him. “Pete was there for quite a while. He was wonderful.” Eventually Pete’s father-in-law, Spike Drady of the Nicasio Volunteer Fire Department, took over traffic control in his NVFD jacket. As a retired Highway Patrol officer, Spike knew the drill. Sparsely Sage and Timely is powered by	WordPress 4.9.10 and delivered to you in 0.325 seconds using 50 queries.